One of the most controversial and popular video games out at the moment is DayZ. Originally a modification of the hyper-realistic military game ARMA II, the game has just recently been released as a standalone project in early alpha on Steam. The game drops you off in the deserted countryside of fictional Chernarus, pitting you against zombies and other players around the world fighting for equipment and food to survive. To say that DayZ is a brutal game would be an understatement. Contact with just one zombie without a proper weapon is enough to kill you, let alone running into other players equipped with guns that want your stuff. That’s where DayZ Central SA comes in. 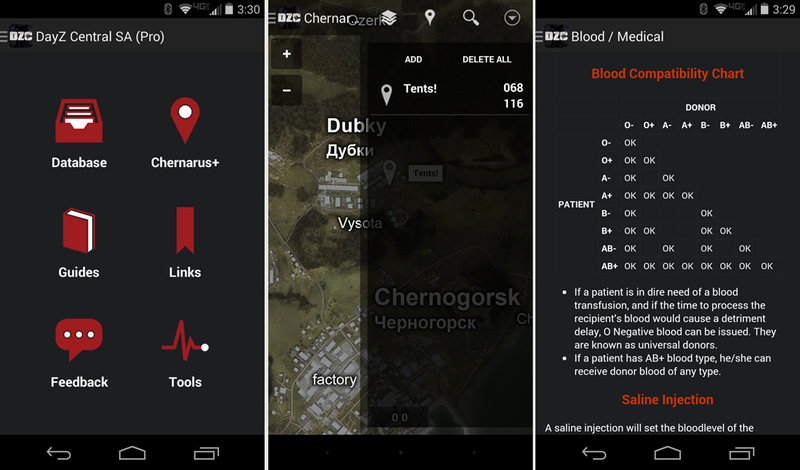 This handy and well-built application gives you all the information that you need to survive in Chernarus, whether it be locations of water spouts to get a drink or where to find a gun to protect yourself. The app even goes into some of the deeper aspects of DayZ that can be hard to figure out on your own like the injury, blood and food system. Knowing which blood type your character is and how to cure disinfectant spray poisoning could mean the difference between life and death for your character and his loot. DayZ Central SA gives all of this information and more, which will surely keep you alive out in the wilderness. The developer even did a fantastic job of adhering to the Android Design Guidelines and offers side menus for easy navigation. The application is free, offering vast amounts of information, but the Pro unlocker only costs $0.99 and gives you even better intel on which buildings you should be checking when you head into town. There is also a DayZ Central app built for the ARMA II Mod version of the game as well if you are still rocking that. Either way, if you are playing DayZ you should seriously give this app a look.